Of the six states, the main opposition party, PDP, was leading in five, while Mr Buhari's party, APC, was leading in Plateau. 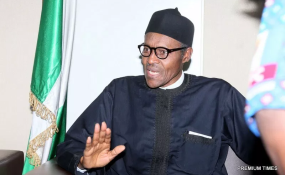 The presidency in a statement by Mr Buhari's spokesperson, Garba Shehu, said it was aware APC members were criticising Mr Buhari for not interfering in the electoral process to favour them. "Interestingly, while members of the ruling APC party were criticising the president for not interfering on their behalf, members of the opposition were condemning the president based on their assumptions that he would definitely interfere, as many in the opposition did while in power," Mr Shehu wrote. The presidency also rejects unfair and ridiculous criticisms of President Muhammadu Buhari's apparent disinterest in the upcoming elections in some states by party members who wrongfully assume that the president will abuse power by changing results to favour them. Party members in states where there will be supplementary elections then need to be reminded that they need to work hard to earn their people's votes, rather than expect President Buhari to manipulate INEC in their favour.